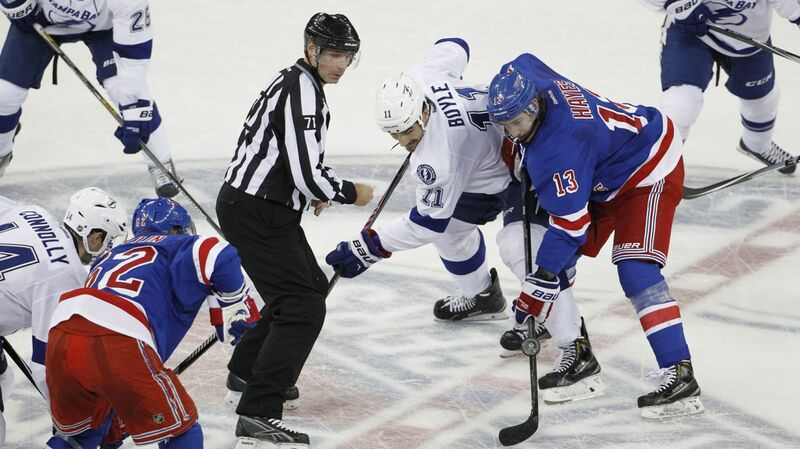 The Rangers and Lightning are meeting in the playoffs for the first time ever, with strong connections on both sides. This could be a special series for both teams. Photo courtesy of MSG Photos. Last night, the Rangers became the first team in NHL history to overcome a 3-1 series deficit in consecutive years following Derek Stepan’s overtime heroics at Madison Square Garden, sending his team back to the Eastern Conference Finals for the second consecutive year, and the third time in the past four years. Now, the Rangers and the Tampa Bay Lightning will face off in the postseason for the first time ever, fighting for a chance to play for the Stanley Cup. But connections and bloodlines run deep with these teams, making this matchup truly special. On March 5th, 2014, just hours before the trade deadline ended, the Rangers traded their captain, Ryan Callahan, as well as two draft picks to the Tampa Bay Lightning for their captain, future hall of famer Martin St. Louis. Contract negotiations between Ryan Callahan and Glen Sather went downhill, and the relationship between Martin St. Louis and Steve Yzerman had soured, prompting St. Louis to request a trade to the one place he wanted to be; New York. That is the most significant connection between these two teams, but the Lightning also signed Brian Boyle and Anton Stralman in the offseason, both key performers on the Rangers’ team last season. Boyle was a big body with good hands on the fourth line, and Stralman was an extremely underrated second pair defenseman. Boyle scored 15 goals this season, and Stralman has developed his offensive game under John Cooper, posting career highs in goals (9), assists (30), points (39), and plus/minus rating (22). Dan Boyle was also on the Tampa Bay Lightning with Martin St. Louis back in 2004 when they hoisted the Stanley Cup. Boyle had two goals and eight assists in the playoffs that year, and was an important part of their blue line. 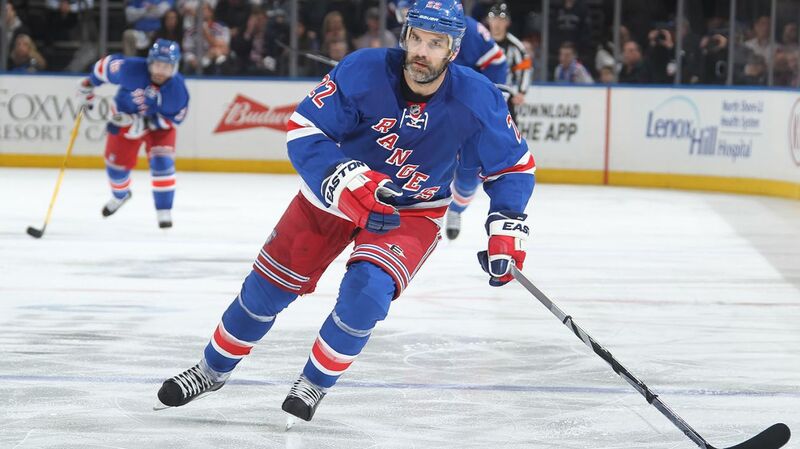 Dan Boyle, along with Martin St. Louis, won a Stanley Cup with the Tampa Bay Lightning back in 2004. Photo courtesy of MSG Photos. All of the former connections, coupled with what looks to be another good goalie matchup, as well as two good offensive teams sets the scene for what could be an extremely memorable Eastern Conference Finals. The Rangers and Lightning have not played in five and a half months after they met three times in a span of two weeks from November 17th to December 1st. Tampa Bay won all three games, outscoring the Rangers 15-8. But if the playoffs have taught us anything, it’s that you can throw everything that happens in the regular season out the window. The Wild took down the St. Louis Blues, a cup favorite by many coming into the playoffs. The Red Wings gave the Lightning a scare and took the series to seven games, with most people thinking that series would be over in five games or less. And the Rangers handled the Capitals pretty well in the regular season, but that series also went seven games. The Rangers also had not hit their stride when they played the Lightning, and we’re still trying to figure things out and deal with injuries to guys like Dan Boyle, Ryan McDonagh and others. Following the third loss to the Lightning, they then lost a game in Detroit. After that, they finished the season 42-12-3. Clearly they team turned the page after they played Tampa. The Tampa Bay Lightning are back in the Eastern Conference Finals for the first time since 2011, when they were defeated in seven game by the Boston Bruins, who would go on to win the Stanley Cup over the Canucks. They have not made it to the Stanley Cup Finals since they won in 2004. The Lightning needed 13 games to get back to the Conference Final. They beat the Detroit Red Wings in seven games in the first round, overcoming a 3-2 deficit, and then built up a 3-0 series lead on the Canadiens and clinching in six games. The Lightning were the best offensive team in the regular season, finishing with 259 goals for, and averaging 3.15 goals per game. Unlike the Rangers, they have not struggled at all to score goals in the playoffs, with 34 goals in 13 playoff games, an average of 2.62 goals per game. They’re probably the most dangerous offensive team left in the playoffs, with the Anaheim Ducks not far behind. 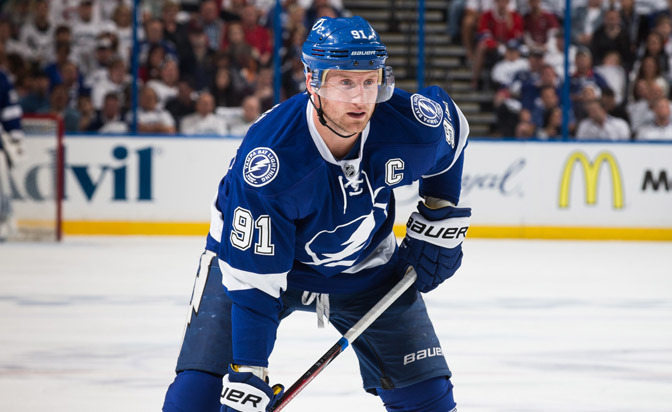 The most skilled offensive player on the team is their first year captain, Steven Stamkos, one of the elite goal scorers in the NHL. He led the team with 72 points and 43 goals in the regular season, but got off to a very slow start in the playoffs. But he’s been much more effective in the series against the Canadiens, carrying a five point streak into Saturday (1-5-7). Clearly he will be the focus of the Rangers defensemen in this series, but there are a lot of other dangerous players on the Lightning. Stamkos started the playoffs slow for the Lightning, but now has seven points in his current five game point streak. Photo courtesy of Scott Audette/Getty Images. Tyler Johnson is having an outstanding playoffs, leading his team with eight goals and 12 points, and providing the spark his team needs when they’re down or need some sort of jolt. The 24 year old is developing into one of the league’s top players, as well as centering arguably the best line in the NHL. Tyler Johnson, Nikita Kucherov and Ondrej Palat have combines for 17 and 14 assists in the playoffs. That’s unreal, but they did the same thing in the regular season. All three of them scored over 60 points in the regular season, and they’re still the best line for the Lightning in the playoffs. Palat is more of the set up player, with three goals and five assists in the playoffs. Kucherov and Johnson do the scoring, with six and eight goals scored in the playoffs, respectively. Watch out for this trio. They can do some serious damage. Ryan Callahan missed Game 6 against Montreal due to requiring an emergency appendectomy. But as Rangers fans know, he’s a tough player, and was seen back on the ice for the Lightning’s practice Thursday afternoon. He has just three assists in the playoffs, but he’s a big body, a good penalty killer, and a physical presence. He scored four goals with one assist against the Rangers in the regular season. On defense, Victor Hedman and Anton Stralman make up the top defensive pair. Hedman may be the best defenseman to not be names a Norris Trophy finalist. He’s excellent with the puck, strong on the power play, and more than capable defensively. He’s also 6’6” and 230 pounds, so he’ll throw the body and get in the shooting and passing lanes. Coupled with Stralman, who was a very strong defensive player with the Rangers, and the Lightning have a very good top defensive pair. Braydon Coburn and Jason Garrison are the more physical defenders, making up the second defensive pair, with Andrej Sustr and Matthew Carle making up the final pairing. John Cooper does like to play seven defensemen, and if he does, Nikita Nesterov will come in. He has a goal and two assists in eight playoff games this year. In his first ever playoff run, Ben Bishop has done a solid job in net for the Lightning. In 13 games, he has an 8-5 record, giving up 23 goals on 332 shots for a 1.81 GAA and a .931 save percentage. He’s been at his best when his team really needed him, such as his 31 save shutout performance in Game 7 against the Red Wings, and his one goal, 43 save performance in Game 1 against the Canadiens. His 6-foot-7 frame makes it nearly impossible to screen him, so the Rangers will have to rely more on low shots and rebounds. He’s also had tremendous success against the Rangers in his career, with an 8-0-0 record, two of those wins being shutouts, a .946 save percentage, and a 1.49 GAA. But like I said earlier, everything gets thrown out the window in the playoffs. Is Bishop going to perform as incredibly as Braden Holtby and Marc-Andre Fleury did against the Rangers? That remains yet to be seen. The Rangers are coming off of an extremely emotional comeback, scoring in overtime to advance to the Conference Finals. It took them 12 games to get here, eliminating the Penguins in five games and then taking the Capitals through a full series. All 12 games have been decided by one goal, including eight 2-1 final scores, and four overtime victories for the Rangers. Henrik Lundqvist may be playing the best playoff hockey of his career, and is coming off of a near flawless series against the Capitals, allowing just 12 goals in seven games. He’s allowed just one goal in seven of the 12 playoff games, and two goals or less in 10 of the 12 games, which is really, really good. His 1.60 GAA and .944 save percentage leads active goalies in the playoffs, and is near the top when looking at all goalies through two rounds. 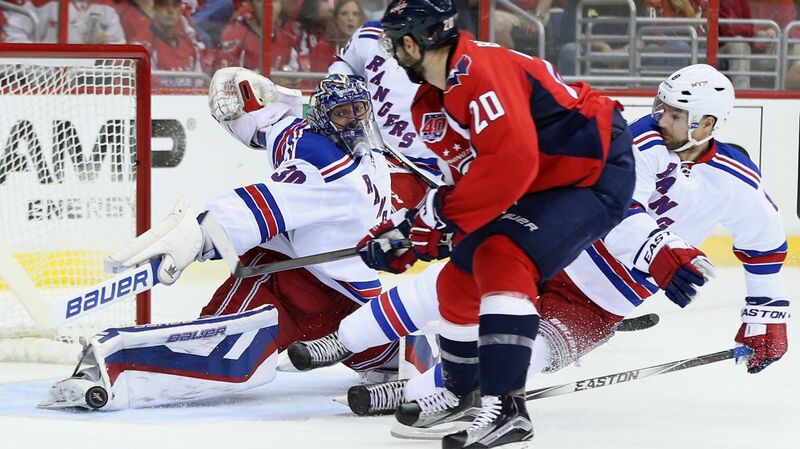 Lundqvist has just one game with a save percentage below .930 in the playoffs. He’s consistent, and he’s been consistently good. Henrik Lundqvist has been absolutely incredible in the playoffs, stealing games for the Rangers, making incredible saves (like this one) and helping his team win. Photo courtesy of Getty Images. While I don’t think Bishop vs. Lundqvist will be as intense or competitive Lundqvist and Holtby’s duel was, but the Rangers will need him to be at his best, especially against the high-powered Tampa Bay offense. In the first two series, the Rangers’ opponents focused on eliminating the speed game, taking away the space available in the neutral zone. This forced the Rangers to try and alter their game plan, avoiding the stretch pass and trying to dump and chase, setting plays up behind the net. The Lightning are one of the few teams that can match the Rangers speed, which means we are more likely to see better scoring chances, more odd man rushes, and a more open style of play. However, the Rangers don’t want to get into a track meet with the Lightning, because Tampa Bay also thrives in that style of play. The Rangers would be better to stay true to their defense-first style mindset, keep up their relentless forecheck, and take advantage of the open space when it is given to them. 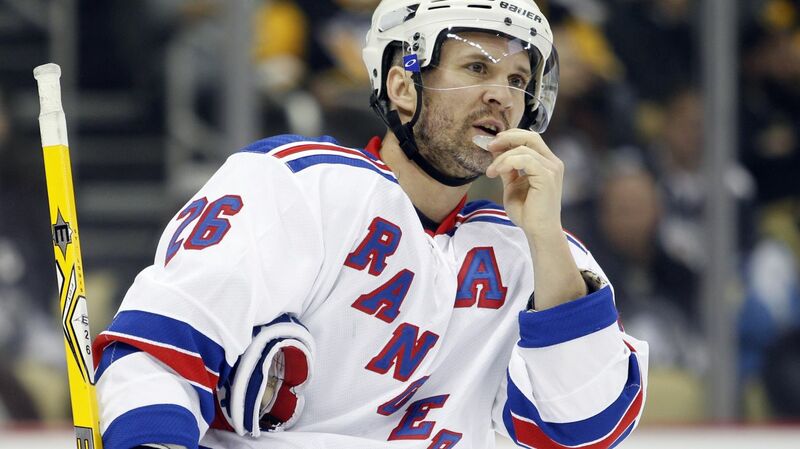 Everyone is saying it, but all eyes are on Martin St. Louis in this series. He’s struggled a bit in these playoffs, with just four assists in 12 games, but he’s always been a streaky scorer. Facing off against his former team, where he made his legacy, won the Stanley Cup, St. Louis should be very motivated to beat his old club. He scored two goals in the three regular season games against the Lightning. Martin St. Louis, the former Lightning captain, has all eyes on him in this series. Maybe playing his former team will be the spark he needs to get his production going again. Photo courtesy of Getty Images. Chris Kreider emerged as one of the most dangerous skaters on the ice, scoring four goals against the Capitals, including the tying goal in Game 5 with 1:41 left to go in the game. His unique blend of speed and size is unparalleled in the league, allowing him to beat his defenders and then use his strength to ward them off as he is getting to the net. He’s also a wrecking ball on the ice, laying down big hits (team high nine hits in Game 7), and wreaking havoc in the offensive zone. Alongside Derek Stepan and Jesper Fast on the new, dynamic third line, Kreider could have just as big of an impact in this series. When Vigneault switched up the lines against the Capitals, he moved Dominic Moore up to the third line, looking to get him more involved, centering Carl Hagelin and Kevin Hayes. This was the best line for the Rangers in Game 7, creating a plethora of chances from all of the skaters, and rarely spending any time back in their own zone. The decrease in responsibilities for Hayes made him more comfortable, and he played better after being shifted to the wing. And Carl Hagelin constantly creates pressure with his speed. But Dominic Moore could be a real X-factor in this series. Now that he’s been bumped up alongside more skilled wingers, he’ll get to showcase his offensive abilities, something he likes to do when given the chance. He has just one assist in the 12 games, but he’s the Rangers’ best faceoff man (53.1%), gets the puck to the net (18 shots on goal), and gets to the front of the net. This third line is growing and getting better, and Moore, a former member of the Tampa Bay Lightning, could play a bigger role in the Conference Finals. Dominic Moore became a lot more involved when bumped up to the third line. Now playing with skilled wingers, Moore could make a huge difference in this series. Photo courtesy of MSG Photos. The Rangers may have the best defensive group in the entire league. Part of the reason is because all six guys are defensively responsible, but they’re always ready to join the rush and create offense when the time is right. Ryan McDonagh has gotten better as the playoffs progress, with two game winning goals. 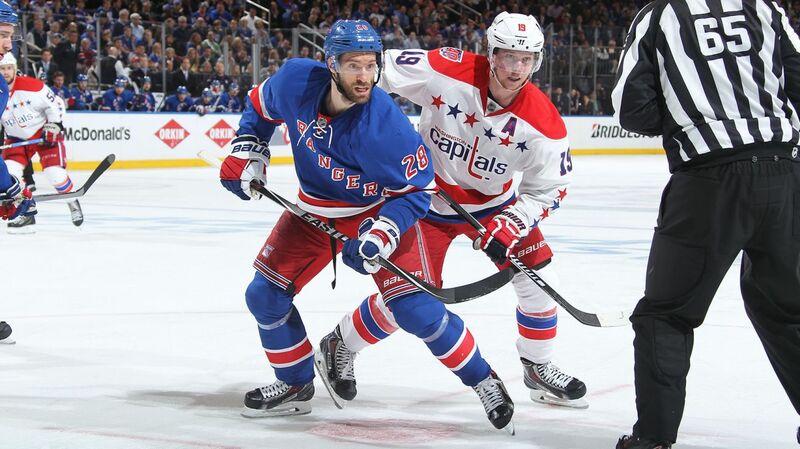 Dan Girardi is a steady, shot blocking, physical defender who rarely makes mistakes. Marc Staal is a shut-down defender, and Kevin Klein is also very responsible. And then Dan Boyle and Keith Yandle round out the six defensemen, both offensive defensemen that can quarterback the power play and connect on those long stretch passes. It’s a very well-rounded defensive group, and one of the best there is. Out of the defensemen, my X-factor is Keith Yandle. After Derek Stepan scored the goal in Game 7, Yandle looked more excited than anyone, throwing hi-fives to everyone, and embracing the nearest teammate he could find. Keep in mind, Yandle wasn’t a part of the comeback last season, or the cup run. He came over in a trade from one of the worst teams in the NHL. The fact that he will be playing in an Eastern Conference Final may finally be setting in for him. Yandle was basically given a second chance. He was traded to the team with the best record in the NHL, and he has a legitimate chance at challenging for a Stanley Cup title. I think he will be extremely motivated and energized. He has four assists in the playoffs, but could be better. And I think he will be. 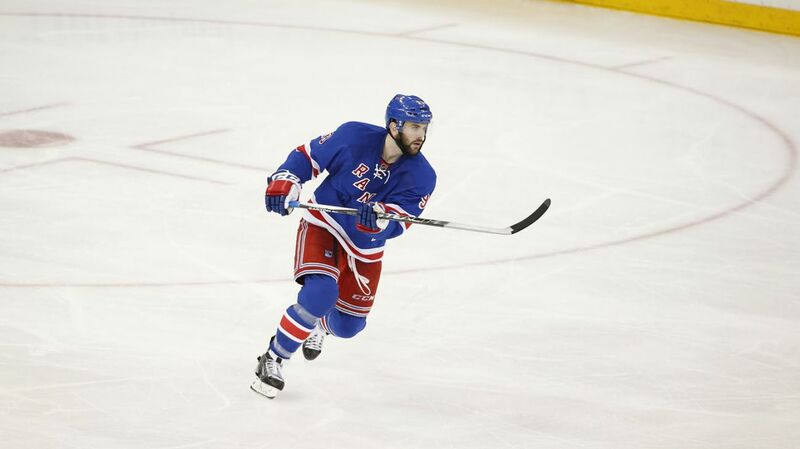 Keith Yandle seemed thrilled to be given a chance to play in the Conference Finals. That motivation could be what he needs to push him to the next level. Photo courtesy of MSG Photos. This will be an exciting, action-packed series, with more offense and chances. Although the Rangers are a good speed team, they’d be smart to control the pace of play, take the Lightning out of their element, and then capitalize on the space given to them. Ben Bishop is playing in his first Conference Final, and doesn’t have as much experience as Lundqvist, or Holtby for that matter. The Rangers can match the Lightning’s speed, have a deeper defensive core, and a better goalie. It’ll be a close and thrilling series, but they can do it. The Eastern Conference Final begins Saturday afternoon at Madison Square Garden at 1 PM. The Blueshirts continue their quest to change the ending. Below is the schedule for the series against the Lightning. Posted on May 15, 2015, in Rangers Updates and tagged Alain Vigneault, Ben Bishop, Cam Talbot, Carl Hagelin, Chris Kreider, Dan Boyle, Dan Girardi, Derek Stepan, Derick Brassard, Dominic Moore, Hartford Wolf Pack, Henrik Lundqvist, James Sheppard, Jesper Fast, JT Miller, Keith Yandle, Kevin Hayes, Kevin Klein, King Henrik, Madison Square Garden, Marc Staal, Martin St. Louis, Mats Zuccarello, Matt Hunwick, MSG, MSL, New York Rangers, NHL, NHL 2014-2015 Season, NHL Playoffs, NY Rangers, NYR, Rangers, Rangers Nation, Rangerstown, Rick Nash, Ryan Bourque, Ryan McDonagh, Stanley Cup Playoffs, Steven Stamkos, Tampa Bay Lightning, Tanner Glass, The Ranger Zone, Tyler Johnson, Washington Capitals. Bookmark the permalink. Leave a comment.